I am pleased to present the first ever Guest Contributor to ChemKnits, Marilynn from Napa, CA! According to Marilynn, "I've been knitting for about two years. This is the first time I've designed a pattern. There weren't many felted Kindle covers online..." so she created this lovely cover to provide your eReader with extra protection. 11th row (and all odd rows) decrease 2 stitches, one at either end of the row. 12th row - K1, P until last stitch, K1. Repeat rows 11 and 12 - until 2 stitches remain. Bind off. Attach to top of cover by either mattress stitch or picking up stitches. Felt until slightly larger than the Kindle (7.5”H x 4.8”w). Measure during felting process so it doesn’t shrink too much. It can be stretched, to a point, before it dries. Sew squares of Velcro at end of the inside of the flap and to appropriate spot on cover. Sew a decorative button to the outside of the flap. 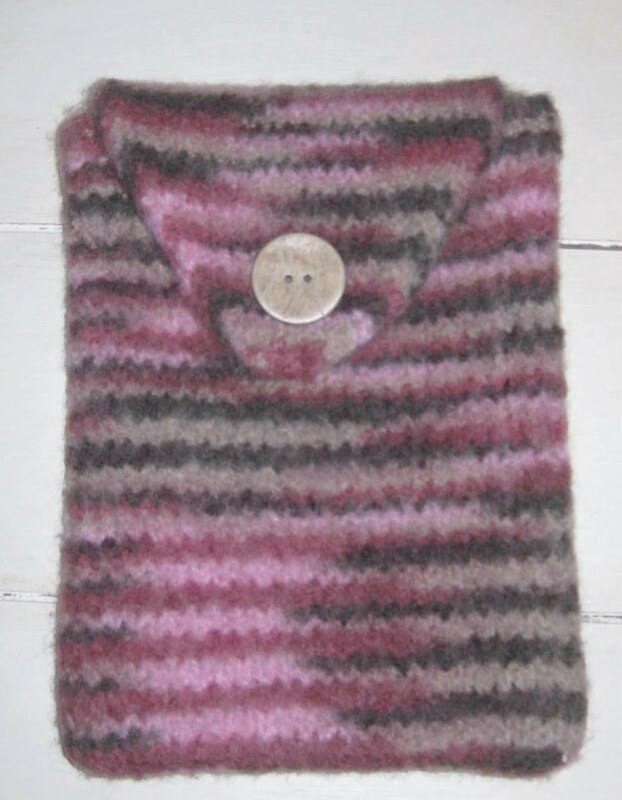 I hope you enjoy Marilynn's Felted Kindle Cover as much as her Shih Tzu and cat who kept her company as she designed this knitting pattern for you. I am so glad that she found me through my article on free iPad Cover knitting pattens so I could help her share this pattern with you! This pattern was created by Marilynn and published at ChemKnits.com for your personal or charity use. You are not distribute or reprint this pattern without the permission. Thanks so much for the great pattern. This will work for the Nook, right? Also, will this work in garter stitch? I know it may not be the same size and may require more or less felting, but I am just making sure that there is no special reason for using stockinette stitch. I already have a case for my Nook, but my sister wants to get one, so if she does I may knit her one. I did not knit this pattern myself, this was a pattern contributed to ChemKnits. There is no special reason for using stockinette stitch that I can see, besides just design aesthetic. Garter stitch should work just fine. Make sure you check the size and that your gauge is big enough to fit the nook. Good luck! I did not knit this myself (it was a guest contribution). The way the pattern is written, the flap is knit separately from the body, so yes you bind off all of the original 56 stitches. Alternatively, you could bind off 26 sts as you suggested to make the flap out of the remaining 30. Good luck! P.S. I will adjust the pattern above accordingly. Could not be happier for my second project. I used 3.5mm needles, wash+filz it in fine and hand washed using hot and cold water. Fits my 2013 kindle fab!